Terrence Harris was born in 1939, in Kingsbury, North London. As child he was a fast runner and got called “Jet” by his school friends and the name stuck. From an early age he had an ear for music and enjoyed the bass sound on Winifred Atwell's " Cross Hand Boogie" (1952). He started playing in a school group when he was fourteen. He left school at fifteen and became an apprentice welder making milk churns. He had learned to play the clarinet but eventually settled on the double bass. Jet started gigging in jazz clubs and his first professional engagement was with Terry Dene. In 1957, he worked in the 2 Is Club, Soho selling coffees and cokes whilst playing bass in bands, including Tony Crombie's Rockets. 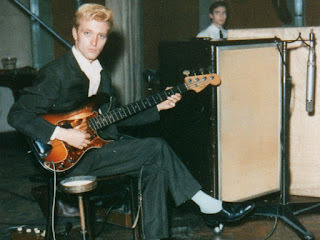 Post War austerity meant electric guitars were a rarity in UK but because Crombie wanted his band to be modern he got Jet a Framus electric bass guitar from the US. Later when it was damaged he imported a Fender Precision Bass, for Jet to play. This made Harris one of the first professional British musicians to play electric bass in England. As a sideman he toured with Wee Willie Harris, and then briefly joined the skiffle band The Vipers with Wally Whyton. The Drifters. Ian "Sammy" Samwell (wrote Move it, High Class Baby, and Dynamite) decided to leave the group and Jet became the resident Drifters, bass player. The new line-up was Hank Marvin (lead), Bruce Welch (rhythm), Jet Harris (bass) and Tony Meehan (drums). Jet played bass on "High Class Baby" and "Livin' Lovin' Doll." The latter was a massive hit in 1958 but later in the same year The Drifters first single, Feelin' Fine/Don't Be A Fool (With Love), failed to chart. The group then recorded the instrumental “Chinchilla” for the soundtrack of "Serious Charge" starring Cliff Richard which pricked up a few ears. At first Atlantic Records objected to the name, Drifters and issued an injunction to prevent the use of the name. At the suggestion of Jet, Cliff’s backing group was renamed The Shadows but chart success continued to be elusive in the early years. Cliff and The Shadows toured the US in 1960 but returned to the UK after making little impression. When the group met singer/songwriter Jerry Lordan, they recorded his composition called Apache. Cliff played bongos. The instrumental was a major UK hit and the first of many with Jet on electric guitar. 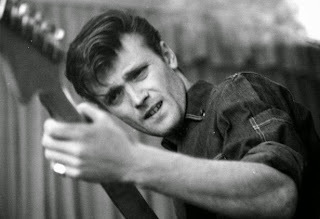 After Tony Meehan left the group and by 1962 artistic differences between Jet and Bruce Welch came to a head and the bass player walked out to pursue a solo career. Jet was initially replaced by Brian "Liquorice" Lockin (Krew Kats). Jet’s first solo recording was a six-string Fender Bass VI guitar version of "Besame Mucho" produced by Jack Good and sold over 50,000 copies. Tony Meehan played the drums. The follow up was called "Main Title Theme" and was taken from "The Man With The Golden Arm". It broke into the Top Twenty and spent 11 weeks in the charts. In 1963, now credited as Jet Harris and Tony Meehan, Diamonds (written by Jerry Lordan) got to the Number One position in the UK Charts (ironically replacing Dance On by the Shadows). The follow-ups "Scarlett O'Hara" and "Applejack" also charted in the same year. As the duo was courting success an almost fatal car accident left Jet with serious head injuries. Sadly, the artist never quite recovered despite several attempts to recapture his pop career. Throughout the 70s and 80s, Jet continued to play and record, working with many artists and enjoying some success on the retro circuit. He rerecorded many of his earlier hits and guested with several bands including The Local Hero's in the 90s. All his adult life he battled alcoholism and despite attempts to stop his health began to deteriorate. Jet Harris died on 18 March 2011, two years after being diagnosed with throat cancer. Jet Harris' singles were relatively unusual in that they made prominent use of the bass as a lead instrument. Big Jim Sullivan was the famous session man who first made use of the technique and Paul McCartney would later take this as his own with Wings.